Take eat… drink ye all of it – Matthew 26:26-27. 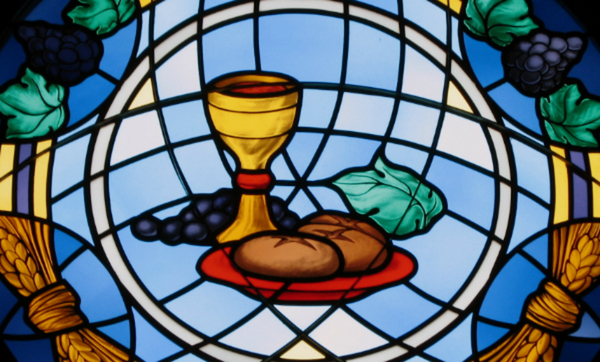 The Lord’s Supper is the true body and the true blood of our Lord Jesus Christ, under the bread and wine, for us Christians to eat and to drink, instituted by Christ Himself.This is God’s Word and the doctrine taught by Luther. But to prevent gross misunderstanding and malicious misrepresentation, it is well to show briefly what kind of eating and drinking takes place in the Holy Supper. Bread and wine are taken in a natural way, that is to say, in the same way in which we commonly receive food and drink. Together with this natural eating and drinking of the bread and wine with the mouth, we also eat and drink the body and blood of the Lord in a sacramental manner. What does this mean? It means that together with the bread and wine we receive the body and blood of Christ in a supernatural manner, in a manner wholly incomprehensible to human reason, in a way past finding out, in a manner such as takes place only in this Sacrament. Seek not to fathom and to comprehend this, my dear Christian; for you will not succeed. Simply believe that together with the bread and wine you receive the body and blood of Christ, not in a natural manner, like the bread and the wine, but in a sacramental, mysterious manner. And to get the real benefit of this, you must observe also a spiritual eating in the Holy Supper. What does this mean? It means that you must know and believe through the Holy Spirit that with the bread and wine your dear Savior offers to you His body which was given for you, and His blood which was shed for you, in order to give you the forgiveness of sins, life, and salvation, and to increase your certainty of the possession of these gracious gifts. PRAYER – Lord Jesus, true God and man, glorified and exalted Savior, who for us, in a way past finding out, dost fill all things, grant me grace firmly to believe that with the bread and wine in the Holy Supper Thou givest to me that precious ransom with which Thou hast purchased me, a poor sinner, namely, Thy body crucified, and Thy blood shed for me. Grant that I may receive this gracious gift in true faith, rejoice in it, comfort myself with it, and boast of it in the face of sin, death, and the Last Judgment. Amen.